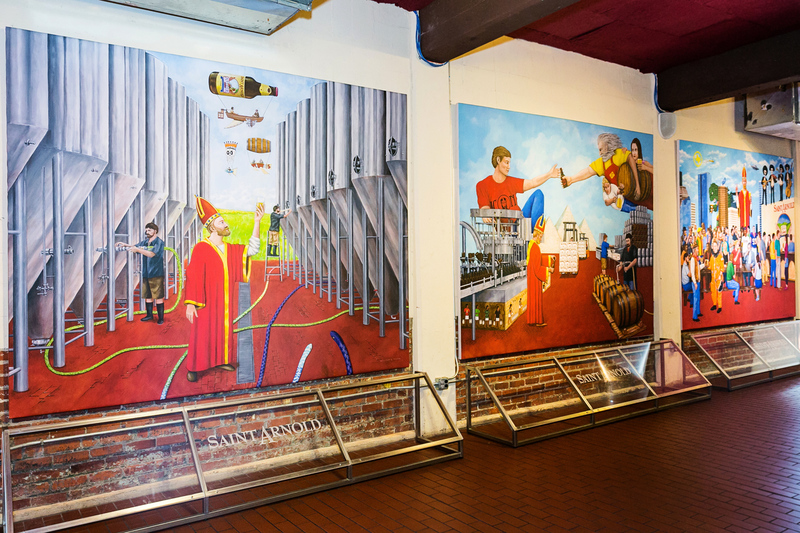 Saint Arnold has been bringing Houston beer drinkers into the craft brewing fold since 1994. The patron saint of brewers was popular for encouraging his followers to drink beer instead of water during the plague. Beer is liquid sustenance, and because brewers boil their wort, safer to drink than water in seventh-century Europe. 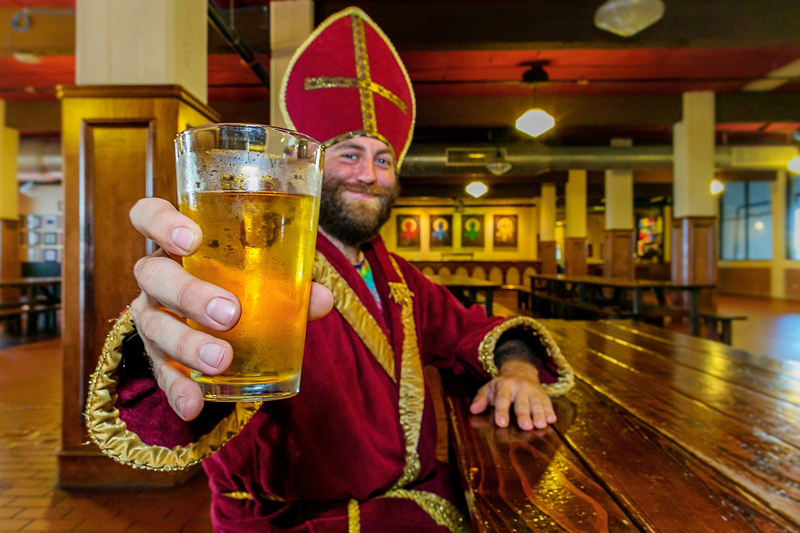 Houston’s Saint Arnold Brewing is GABF’s Mid-Size Brewery of the Year. 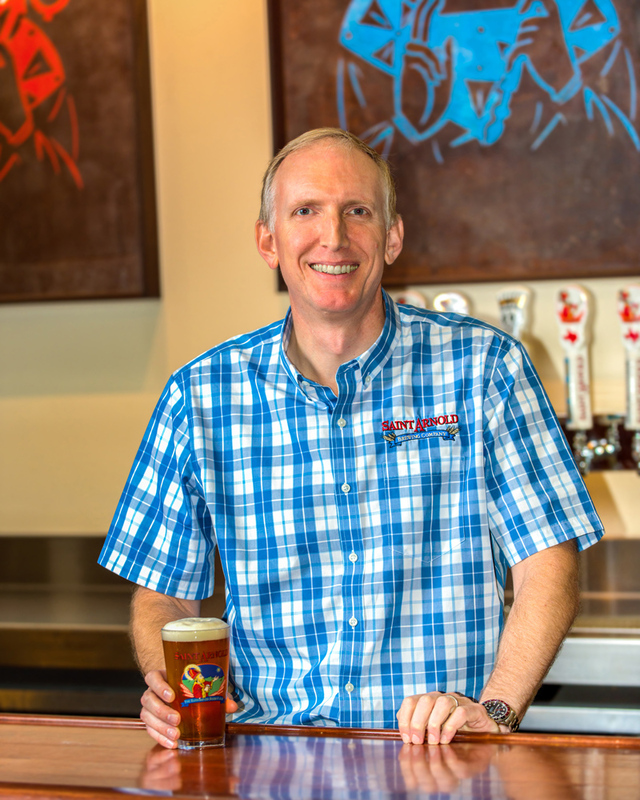 St. Arnold’s owner and visionary Brock Wagner helped begin the Texas craft beer revolution. Asked who his favorite Texas brewers are, he’s hesitant to go on record. “Swifty [Peters, co-owner-brewer of Austin Beer Garden and Brewery, GABF’s 2016 Mid-Size Brewery of the Year] is great. He started Live Oak (also in Austin) with Chip.” Wagner, Peters, Chip McElroy, and Tim Schwartz (now at Real Ale Brewing in Blanco) were there at the beginning, and still reign as the founding fathers of Texas craft beer. 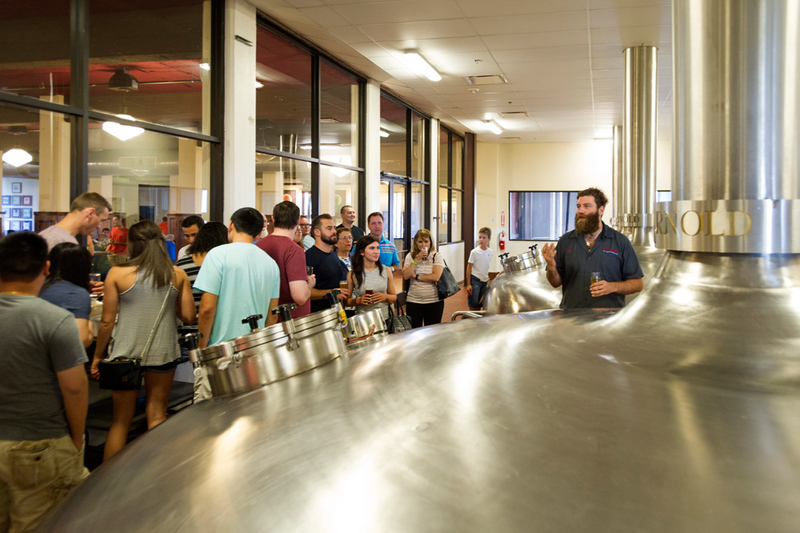 Wagner started out in 1994 with a used 30-barrel brewhouse in a Houston light-industrial warehouse. In 2010 he moved to a two-story solid brick former Houston Independent School District food service building which was built in the 1920’s as a frozen food warehouse by the company that eventually became wholesale food distributor Sysco. “The first thing I had to do was un-freeze the building” said Wagner, climbing the stairs past a 120-barrel Braukon four-vessel brewhouse (capable of producing 100,000 barrels per year) on the first floor. Given Houston’s humid climate, Fancy Lawnmower Beer is St. Arnold’s biggest seller, along with Weedwacker, “a sort of a hefeweizen.” Weedwacker uses the same grain bill as Lawnmower, only adds 8% wheat and Bavarian Hefeweizen yeast. Lawnmower is a malty and crisp Kolsch-style achieved by using an ale yeast fermented at lager temperatures. Original Amber, which Wagner describes as an amber pale ale circa 1994, is brewed with Cascade and Liberty hops. Lawnmower and Weed Wacker use 100% Hallertau Hersbrucker hops. Wagner and his brewers travel to Germany each year to select, because hops change from year to year. 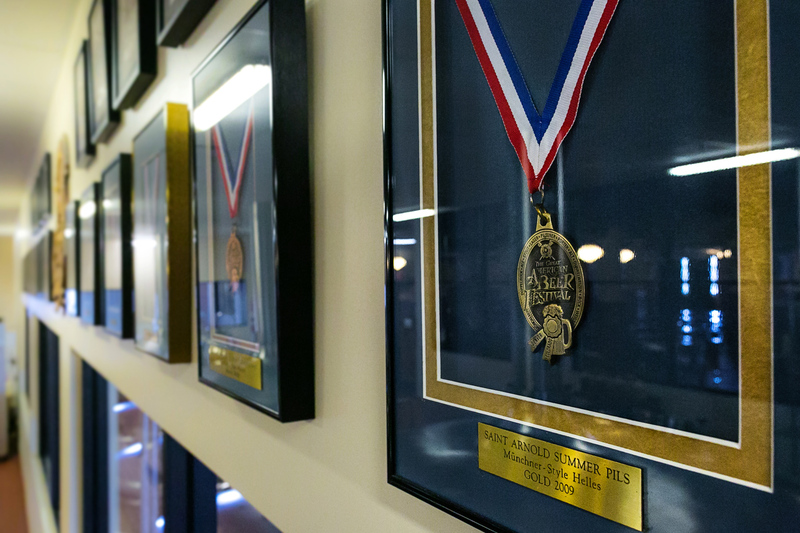 “I’m a believer that great beer recipes use the fewest number of ingredients to achieve success,” says Wagner, who over the years has won 24 GABF and 11 WBC medals. The beer list in March included the delicious Santo – a black Kolsch, Summer Pils – a Munich-style Helles, Five O’Clock Pils – a SMASH pilsner featuring Saaz hops, Punkinator – a pumpkin stout, Endeavour double IPA, and the flagship 32 IBU Original Amber. St. Arnold also produces the bottled Devine Reserve Series, a single-batch small series of big beers, and the Bishop’s Barrel series of barrel aged big beers. Both series are bottled, but also available on tap at good beer bars around the state. Wagner is in the midst of constructing a new 8,000 square foot restaurant and 4,000 square foot beer garden across the parking lot from the brewery. Even though the new building looks flat from the outside, the inside looks like a medieval German church with six arched alcoves (chapels) with stained glass windows above, each decorated by a different Houston artist. The adjoining landscaped and shaded beer garden will include a separate bar and water features; construction should be completed by the summer. In parting, Wagner commented on the great community of brewers in the Houston area. “The brewers have educated the consumers. Now the consumers demand good beer!” he said. He also praised the Texas Craft Brewers Guild, which was instrumental in achieving a 50% two-year excise tax cut for breweries producing less than 60,000 barrels. For the next two years, the tax is reduced from $7 to $3.50 per barrel, while the tax for breweries that produce over 60,000 barrels will be reduced from $18 to $16 per barrel. The guild is also fighting to legalize to-go sales from production brewery taprooms, a benefit enjoyed in most other states. Currently Texas is 46th in the nation in the number of breweries per capita. If to-go sales are approved, the guild projects the number of Texas breweries will rise. 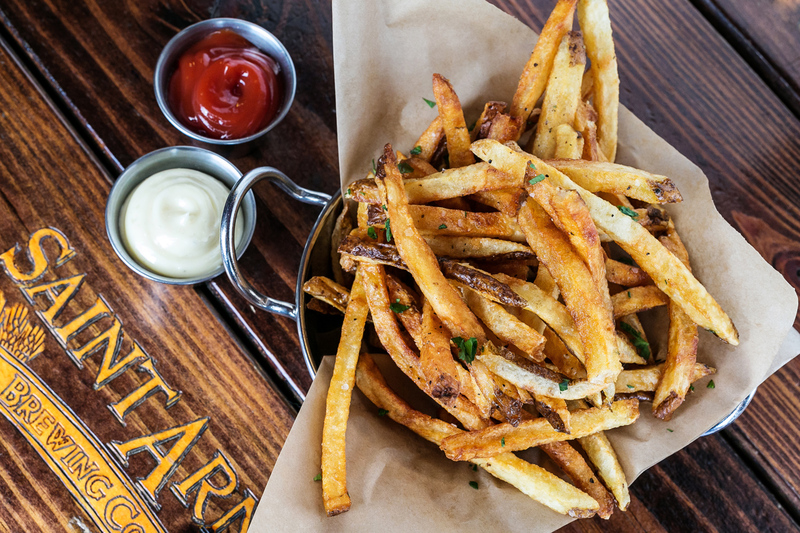 Saint Arnold Brewing is an example that shows Texas craft beer is poised for expansion. Thanks to pioneers like Brock Wagner, crafting quality beer in greater quantities will surely satisfy thirsty locals – who expect nothing less. I’m a Beer fan first and foremost, and when I tell you saint Arnold Brewing has got a gem in the beer industry second to none,and I do mean none,I know what a common man, as well as a sophisticated man needs, it gets no better! Their beer has notes of guava, vanilla, and tons of ruby red grapefruit! True brewmasters! 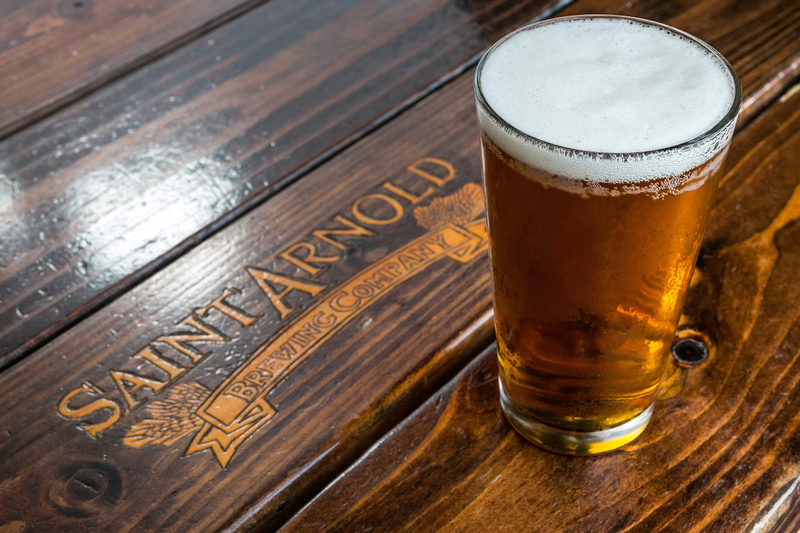 St Arnold is not the oldest craft brewery in Texas. Spoetzl Brewery has been in Texas since 1909.